Manju is our bijou family run Indian restaurant, nestled in the bustling and vibrant North Laines, Brighton. Manju’s is named after our mother. Living and growing up in Uganda, Africa, Manju lost her father at the age of 12 years old. She was taught to cook by her mother and at the age of 14, she was cooking and supplying 35 tiffins a day, just to make ends meet. Manju, our mother, is the inspiration behind our restaurant. After realising her dream of running a restaurant at the age of 80, every dish is cooked with love and passion. 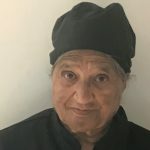 With a lifetime of knowledge and experience, Manju cooks in the kitchen every evening and makes sure everything is served to the highest possible standards. 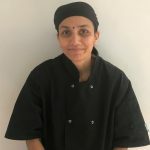 Dipali, our head chef and daughter in law to Manju, is a highly trained chef. Born and raised in Gujarat, she trained as a chef in Surat, the culinary capital of Gujarat. Dipali has many years experience and has cooked in some of the most highly regarded Indian restaurants. Passionate about food from an early age, Dipali’s inspiration comes from Manju.